Not only one of the best retro-ising plugins around, but also a powerful sound-design tool in a general sense, RC-20 is a wobbly, wonky, fizzy, soul-warming slice of awesome. Makes anything sound old. Simple, stunningly effective processors. Space module seems a little superfluous. With the vinyl comeback in full swing and a tape resurgence hot on its heels, it seems the world at large once again values the warmth, wobble and wonder of analogue recording. XLN Audio's latest effects plugin is designed to imbue instruments and mixes with a totally customisable blend of analogue and retro-digital character, via an attractive and intuitive interface that positively invites experimentation. 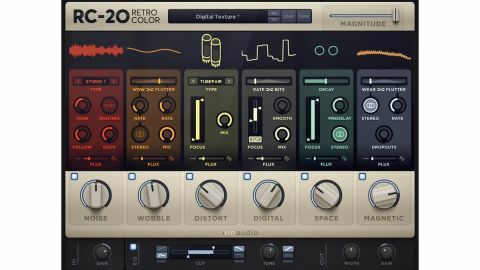 RC-20 Retro Color (VST/AU/AAX) comprises a parallel bank of six modules, each delivering its own type of vintage processing. They can be individually switched in and out, and the row of big knobs at the bottom are essentially amount controls, the exact effects of which vary by module - wet/dry mix, noise level, depth, etc. The Noise module synthesises 16 flavours of seamlessly looped mechanical, electrical, electro-magnetic and electronic noise samples. Two types of vinyl and two speeds of tape are at the top of the list, but they're not actually the most interesting options. No, the real fun comes with the likes of 'VHS', '8-bit Home Computer', 'Studio Ambience' and 'Apollo Lunar Lander'. The Tone knob simply shifts the tonal balance of the noise, tilting towards high frequencies clockwise and low anticlockwise. The Follow knob increases the sensitivity of an onboard envelope follower, making the level of the noise rise and fall with the input signal; while Duck does the opposite, lowering the noise level as the input signal gets louder. There's also the option to reposition Noise at the very end of the signal flow, after the Master EQ, so as to keep its output unprocessed by the rest of the modules. The animated display at the top shows the waveform of the noise. The Wobble module generates tape deck-style pitch modulation with separate Wow and Flutter LFOs, each with its own Rate setting - 0.1Hz to 4Hz for Wow, 6-20Hz for Flutter - and the two blended with the horizontal slider for gloriously wonky cross-modulations, as made visible in the animation up top. Wobble also features a Stereo mode, turning it into a rather lovely chorus effect. Distort is the simplest of the modules, offering six fantastic-sounding and versatile saturation algorithms taken from Addictive Drums 2 and Addictive Keys - valve, transformer, broken speaker and three waveshapers - and a Focus Filter for targeting the effect on a specific range of frequencies, bounded by the two sliders. Distort is a slightly incongruous module, in that it's the only one without an animated graphic - all you get is a static representation of the type of distortion you've selected. The Digital module applies sample rate and bit depth reduction, with a blend slider like that of the Wobble module, and a Smooth control for rounding off the rough edges should it all get too much. It also has a Focus Filter, but this time with a Cut option for ditching everything outside its frequency range. The animation perfectly visualises the effect on an illustrative waveform. We fell in love with RC-20 almost immediately. It's just so much fun to mess around with. The Space module is a pretty unremarkable reverb (a 12-note resonatory, in fact) that doesn't sit particularly comfortably with its neighbours, but is nonetheless useful for dialling in a bit of ambience. Decay and PreDelay controls set the length and onset timing of the tail, and another Focus Filter hones the effect down to a specific frequency range. While it certainly doesn't detract from the rest of RC-20 in any way, we're just not sure why it's there. The animation is also uninformative, visualising only the wet/dry mix. Magnetic is the volume-modulating equivalent of Wobble, simulating magnetic tape degradation. Again, two LFOs are mixed to a complex modulation output: a very slow one (the Wear end of the slider) and a faster one (Flutter, adjustable from 6-30Hz), both with a random element for chaotic irregularity. The Dropouts knob controls the intensity of more extreme volume drops occurring at random timings and durations. The Wear modulation and Dropouts can be generated in mono or independently for the left and right channels, and the animation reflects all of this beautifully. At the bottom of the RC-20 interface, the master section provides a range of tools for shaping the signal coming out of the module rack and tweaking the final output. Both input and output Gains are adjustable (the first primarily useful for driving the Distort module harder), and the Width knob pushes the stereo image of the output from mono through 'normal' stereo to 'sides-only' with the mid component fully attenuated. The EQ section comprises Cut Filter and Tone controls. The Cut Filter is akin to the Focus Filters found in the Distort, Digital and Space modules, being a band-pass model with adjustable top and bottom cutoff frequencies, but with the addition of a choice of two roll- off slopes: one gentle, one steep. Next to that, the Tone EQ biases the frequency response towards the low or high end of the frequency spectrum in Tilt mode, or raises and lowers the mid- range in Mid mode, as selected using the buttons to the right. Notably, all the controls in the master section are scaled by the Magnitude slider, making them much more than just static set-and-forget shaping parameters - which isn't to demean their utility in that regard at all. Each module also features a Flux slider, the particulars of which differ from one to the next, but all of which introduce random variation over time. With Distort, for example, pushing Flux to the right increases the amount of random overdrive modulation applied, while with Space, it randomly modulates the pre-delay. At the top of the GUI, the Magnitude slider scales the six amount knobs and all controls in the master section from 0% to 100% of their set values, macro style. As well as being useful for adjusting the global depth of the plugin as a whole, this makes for a very effective automation target, opening up all manner of weird new takes on the classic filter sweep, amongst other things. We fell in love with RC-20 almost immediately. It's just so much fun to mess around with, and the realism of its artificial ageing processes is staggering. It also boasts a superb preset library that syncs to XLN Audio's cloud server for sharing with other users; and the ability to tweak the six big knobs and the Magnitude slider with the browser open is insanely handy. On the downside, the reverb is so-so, and it's mildly annoying that the modules disappear completely when bypassed - just because we can't hear them, doesn't mean we don't want to see them. But that doesn't significantly impact on what is ultimately one of the finest effects plugins we've come across in a long time. From brightening, dulling and/or roughing up instrumental sources of all kinds, to sending full mixes back in time and performing spectacular real-time sweeps, RC-20 Retro Color is essential.